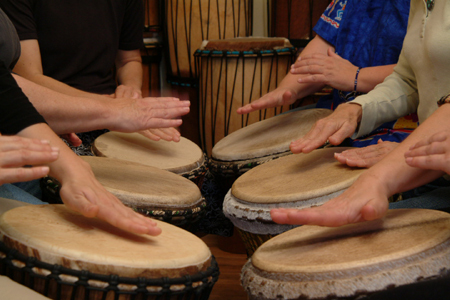 Drumming is a powerful form of yoga, it helps us to come into a deeper state of presence and self awareness. It has been called the language of the heart. The drum beat connects us to our heart, to our breath, our natural rhythms in the body, the beat of the earth, our ancient roots and so much more. Life beats to rhythms. The heart beats, the breath flows, the tides, the seasons, the circling planets and stars, even the shine and fade of the sun occur in varied rhythms and cycles. This is a fun and playful practice that enlivens the spirit and connects us deeply to ourselves. Drumming awakens a knowing within.